Angle mute uses ray tracing and a velocity model to generate mute based on the calculated angles of the seismic wave path. A gather volume and a velocity model are required to define the angle mute. In the Control Panel, open the View menu and select Gather View. At the tab header, click the Add icon and select New Angle Mute. 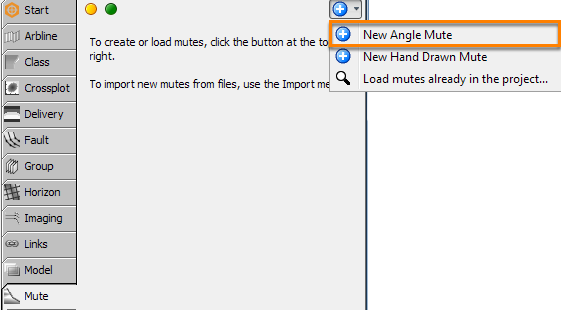 Note: You can also create new Angle Mutes in the Process tab in the Control Panel. In the Process tab, click the Add icon and select New Process. Next, click Angle Mute. Take note that once you have selected this process, the system will automatically switch to the Mute tab and let you configure the settings from there. In the Details Panel, select a Velocity Volume to be used in this process. 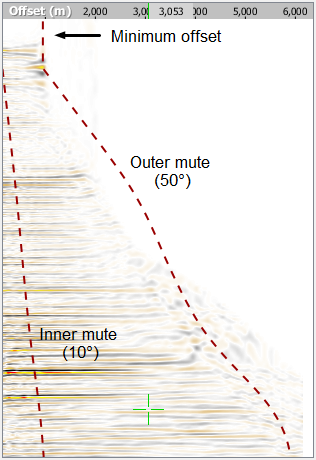 Both 2D and 3D velocity volumes can be used in angle mute. If no velocity is selected, an angle-domain mute will be created. Specify a velocity to apply it to offset gathers. Average Velocity Converted to Depth. 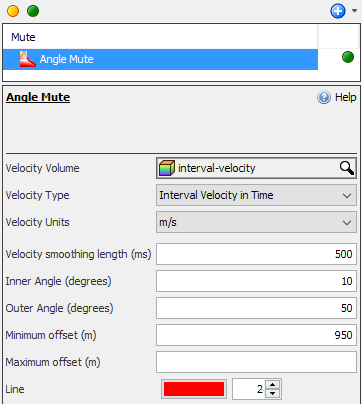 Choose the appropriate Velocity Units for the angle mute. The velocity model should already be smooth, but additional Vertical Smoothing can be applied if necessary. If a smoothing length is specified, the interval velocity is smoothed using a simple moving-window average. At Inner/Outer Angle, input the angle for the inner and outer mutes, with acceptable values ranging between 0 and 90 degrees. As soon as you enter an angle value, the calculated mute will be displayed in the Gather View as a dashed line in the colour and line thickness of your choice. The specified angle is traced through the velocity, using a curved-ray algorithm. Optionally, specify a Minimum and/or Maximum Offset to restrict the mute to above or below a certain offset. Select your preferred colour and thickness for the mute line at Line.